After our November 24th, 2013 Pre-Thanksgiving meeting, followed by dinner with Sage Granada Park United Methodist Church's community, I sat back exhausted, but relished in reflection about how far we have come this past 2013. November's largest support group meeting ever! It generated an overall total of 45 attendees representing SGV API PFLAG. 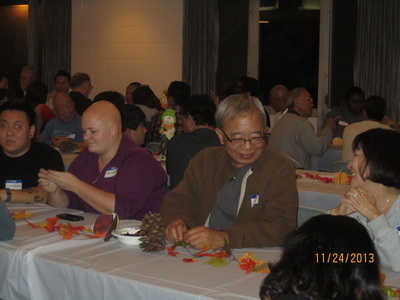 What was also significant was that many couples, families, parents, and allies attended the church's annual Thanksgiving dinner. 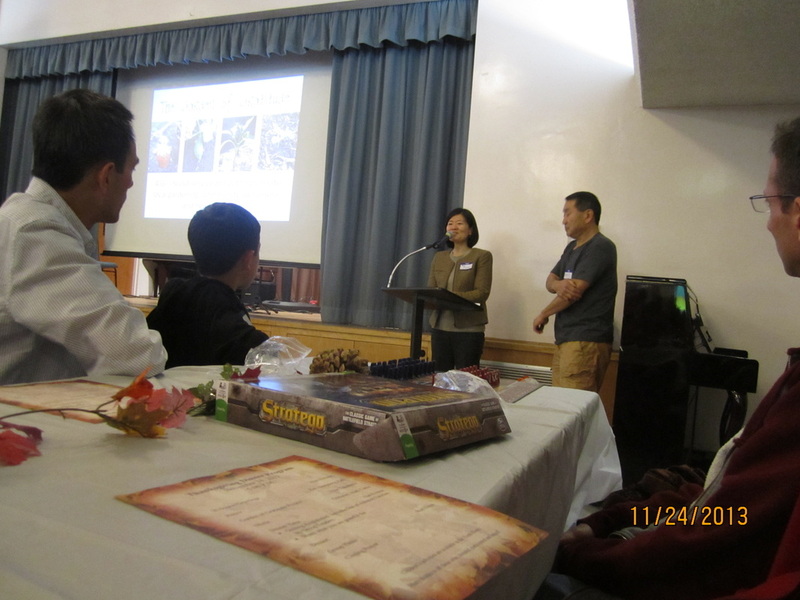 Our gesture of gratitude was demonstrated by high participation or attendance at the dinner. Our hearts were warmed by Rev. Sunny's open invitation and that her congregants welcomed us lovingly. The food was plentiful, and we brought some pies, bread rolls, bread pudding, and salad dressings to share. Newlywed couples came to introduce their new spouses. Fathers brought their kids with them; knowing that it was a family affair. So many new faces; many of them allies. Lots of parents and couples with children! Thank you for gracing us with your presence, your conversations, patience in listening to everyone, for asking those tough questions, for clarifying, for considering us as part of your family. I am always honored and moved by everyone's kindness; our collective nurturance of one another, and the immense trust that abounds in our group; our SGV API PFLAG family! As the year comes to an end, we have much to look forward to when we have our API PFLAG family's support. 2014 will be an even more exciting year! I know all of us will come together to make it so. 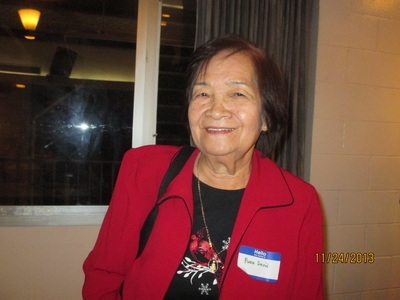 I am eager to hear everyone's ideas; to continue to see their smiles at our monthly group meetings; to have more volunteers at next year's events; and to keep in touch with one another. Joining our API PFLAG family means that one will no longer walk alone. We have each other's backs! The coming weeks of 2013 will be busy for most of us. Everyone around us may be stressed, tense, anxious, excited, rushed. Please be safe as you more about the holiday rush. I hope that you will find respite by coming to our next support group meeting on Dec. 22, 2013. We will have an informal, intimate gathering; a special time to rest; engage in relaxed conversation in a smaller group. We wish everyone a happy holiday with much peace, extended rest, renewed hopes and dreams, and prosperity for the coming new year. Marie Myung-Ok Lee is an author and essayist. She is Korean-American. Her work has been published in The Atlantic, Witness, The Kenyon Review, Newsweek, Slate, and The New York Times. In her painful story describing their life with an autistic child, she referred to an essay called "Welcome to Holland" that had been seen by many. It was passed around to many PFLAGers during the early 1990s after it was published in Dear Abby. "I am often asked to describe the experience of raising a child with a disability - to try to help people who have not shared that unique experience to understand it, to imagine how it would feel. It's like this: When you're going to have a baby, it's like planning a fabulous vacation trip - to Italy. You buy a bunch of guide books and make your wonderful plans. The Coliseum. The Michelangelo David. The gondolas in Venice. You may learn some handy phrases in Italian. It's all very exciting. After months of eager anticipation, the day finally arrives. You pack your bags and off you go. Several hours later, the plane lands. The stewardess comes in and says, "Welcome to Holland." "Holland?!?" you say. "What do you mean Holland?? I signed up for Italy! I'm supposed to be in Italy. All my life I've dreamed of going to Italy." But there's been a change in the flight plan. They've landed in Holland and there you must stay. The important thing is that they haven't taken you to a horrible, disgusting, filthy place, full of pestilence, famine and disease. It's just a different place. So you must go out and buy new guide books. And you must learn a whole new language. And you will meet a whole new group of people you would never have met. It's just a different place. It's slower-paced than Italy, less flashy than Italy. But after you've been there for a while and you catch your breath, you look around.... and you begin to notice that Holland has windmills....and Holland has tulips. Holland even has Rembrandts. But everyone you know is busy coming and going from Italy... and they're all bragging about what a wonderful time they had there. And for the rest of your life, you will say "Yes, that's where I was supposed to go. That's what I had planned." And the pain of that will never, ever, ever, ever go away... because the loss of that dream is a very, very significant loss. But... if you spend your life mourning the fact that you didn't get to Italy, you may never be free to enjoy the very special, the very lovely things ... about Holland." In my previous career as an elementary school teacher, I often began the school year by reading the story of The Rainbow Fish by Marcus Pfister to my new class of bright-eyed first graders. More than half of my students were still learning English, getting used to a group setting where they had to learn the concept of taking turns, while their parents were either unfamiliar with the American public school system or eager to get their child settled in to a new routine. Each new setting unavoidably produces initial feelings of social anxiety as all of us need and wish for a sense of belongingness in our social environment. My first lessons focused on building a community in my classroom; a collective group who would respect and share their cultural differences and value their uniqueness as an asset. I wanted my students and their families to know that our classroom celebrated who they are, where they come from, the languages they spoke, appreciated where they lived and valued what they have or do not have. When I read the story of the Rainbow Fish to my class, I used the main character's narcissist personality traits in addressing aspects of privilege, human condition, individual differences, pluralism, and globalism. For me, the fish symbolized all these qualities of existence. In actuality, the story was about this fish who swam in new waters and all the other plain-looking fish marveled at the Rainbow Fish's glimmering, colorful scales. Many of them asked him if they can have a sample of just one of his scales to brighten their own presentation. Rainbow Fish haughtily said "No!" and swam away. Pretty soon, the other fish realized that he was not interested in getting to know them; perceiving them inferior, so they left him alone. Rainbow Fish became lonely. Realizing that beauty was not about parading one's advantage, Rainbow Fish began to share his colorful scales. Soon, his circle for friends and connection to the sea creatures grew. "Holidays come and go; the anticipation, anxiety, preparations, and ensuring that every aspect, word and deed, and that everyone is acknowledged, all come with the territory of consolidated events with family and friends whom we hold near and dear. This describes who each one of you are to us and with one another! 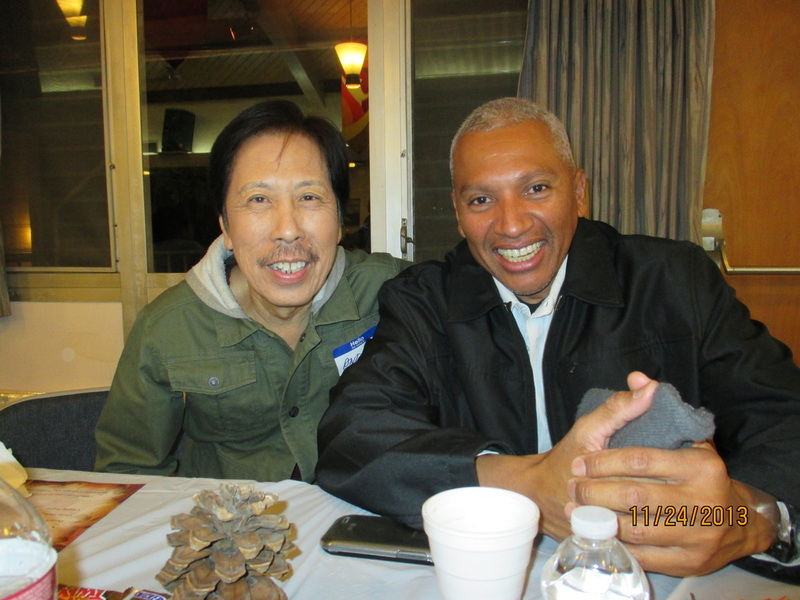 This past November SGV API PFLAG group meeting and "mixer", themed "Thanksgiving with Our Rainbow Family" was a special time in which we shared some of our memories in the past few months that we have known each other, and it was also a time to welcome new faces. Our group is filled with so much love and care. It was as if our hearts and soul were served up on a silver platter; available for all to take part in its contents; its ingredients of: vulnerability, trust, deep sense of kinship, honest sharing of frailty, of significant events in our own lives, of a collective purpose to always strive for justice, no matter what the color of our skin is, and most especially, who we are. It was a special honor to have each one of you, as individuals, to have shown and stayed at this gathering. We shared tables and meals. We shared smiles, laughter, well-wishes, and hugs. We shared experiences; some borne out of deep-rooted culture. SGV API PFLAG is a place of acceptance; of unconditional love; a venue to say what we feel; to cry when we need to; to practice how we are to move about the outside world who needs to become aware of the beauty of pure love. Perhaps it takes me in so many words to express my sincerest gratitude for all that you are. Having you as part of our meeting is a blessing indeed. A simple "Thank you for being there" does not adequately convey how much you made a tremendous difference one another. There is also one individual whose love and work sometimes goes unnoticed because he is part of the backbone and machinery of these gatherings. I would like to recognize and thank Andre Ting for providing us our regular meeting venue. 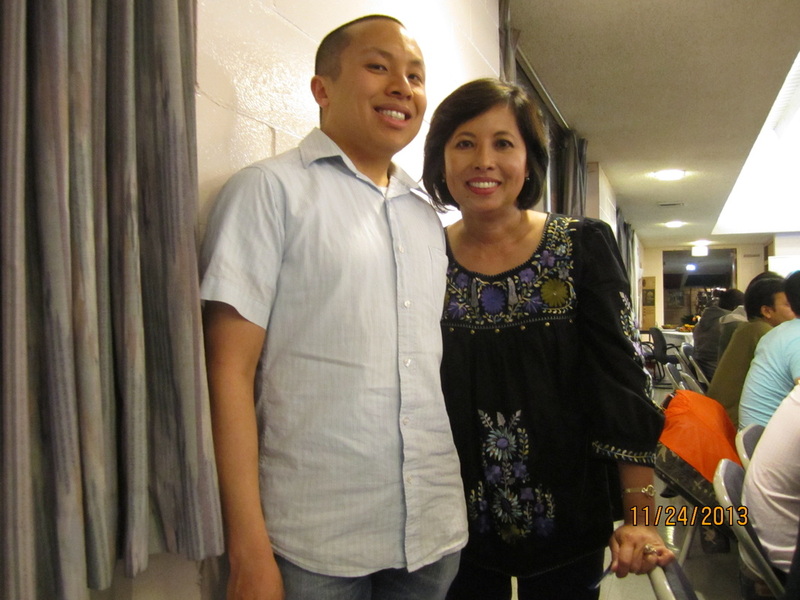 His generosity in allowing the SGV API PFLAG to use his facility for free began in April 2012. He sets up tables, chairs, restrooms, and gives time in continuing to reach out to other LGBT organizations and bringing to their awareness the existence of SGV API PFLAG. Andre has recruited many of our attendees, due to his involvement with the Chinese Rainbow Association, Asian Pride Council, the coordination of the Afternoon Tea with Asian Parents, to name a few. We are fortunate to have a fairly centralized location to meet, all solely due to Andre's support. Finally, the Leadership Team of SGV API PFLAG wholeheartedly express how proud and privileged we are to have you with us and we hope that you will return. Though the November meeting was more of a "mixer", and not our regular support group meeting format, we hope that you will return to experience what you may have endeavored to find: a safe space where you can express yourself within an empathetic and culturally-sensitive setting. Our SGV API PFLAG is all about inter-generational dialogue. It is for LGBTQ persons; for API parents/family members of LGBTQ, and for straight allies. The end-of-the-year is upon us. This time of year always prompts us to reflect upon the past year and to renew our hopes, dreams, and goals for the next year: 2013. Please know that the SGV API PFLAG will continue to be a CONSTANT source of love and support in your lives and also in our lives. This is a mutual relationship and one that is everlasting. You are no longer in the company of strangers, but of loving extended family members!"